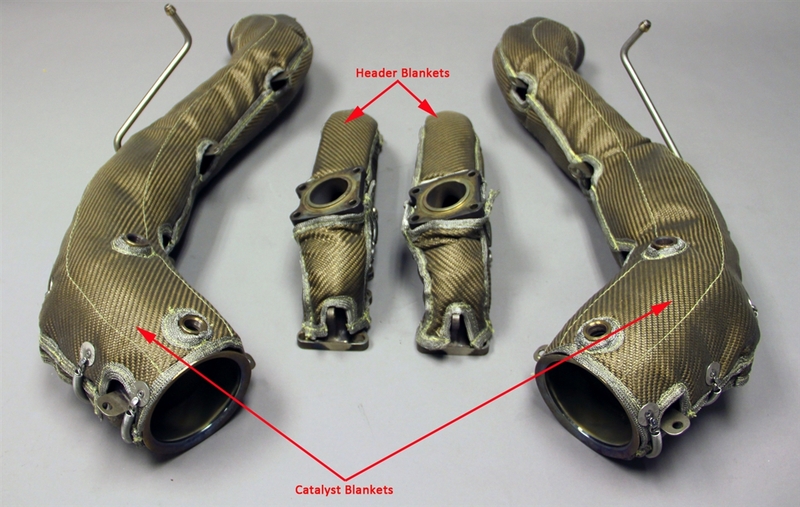 Our custom-made heat blankets are made in the USA from the highest grade Carbon/Kevlar materials to dramatically reduce exhaust heat radiated into the engine bay. Exhaust heat has a significant impact on the McLaren's intercoolers, which is positioned next to the exhaust and become quickly heat soaked due to their close proximity. Hot intercoolers are less effective at cooling the boosted air from the turbos, resulting in higher intake temperatures and less power. Our heat blankets reduce heat transfer from the catalyst pipes to the intercoolers and surrounding components, improving intercooler efficiency for more consistent power delivery. Our blankets will work on the OEM Catalyst pipes or any OE replacement aftermarket system. The net effect is Lower Temperatures = Higher & More Consistent Power.